A new left-wing organization created specifically to attack Rush Limbaugh, Glenn Beck, Lou Dobbs, Pat Buchanan, and Paul Brown has ties to ex-Obama green jobs czar Van Jones. As NewsBusters reported Thursday, StopTheWitchHunt.org was formed to "call out" what it considers "mischaracterizations and hate speech" by the aforementioned quintet. With the assistance of tipster Bret A. Gehring, NewsBusters has discovered an organizational link to Jones. For those unfamiliar, the Center for Media Justice is "a media strategy and action center that uses strategic communications and media activism to build a powerful movement for racial justice, economic equity, and human rights. Through two program areas and fee for service projects, CMJ strengthens the communications effectiveness of grassroots groups and builds a powerful, integrated movement for media justice and communication rights." Its address is 1611 Telegraph Avenue, Suite 510, Oakland, California. Mission Statement: Youth Media Council builds communications power and defends the communication rights of youth, communities of color, and organizing groups working for racial and economic justice. Launched in 2001 to counter racial stereotypes and anti-youth bias in the news, YMC is a media strategy and action center dedicated to building a strategic and collaborative movement for justice by strengthening media strategy, capacity and action in California and beyond. The web address "http://www.youthmediacouncil.org" does indeed redirect to CMJ. Youth Media Council (YMC) was founded in 2001 as a two-year pilot project at We Interrupt This Message (Interrupt). A media strategy center for the racial justice movement since the early 90s, Interrupt founded the YMC to increase the media strategy and capacity of the youth organizing sector. YMC built upon Interrupt's racial justice communications framework and strong partnerships with racial and economic justice groups. Under the leadership of veteran media strategists Hunter Cutting and Kim Deterline, Interrupt pioneered methods for media capacity building, strategic communications and media watchdog projects uniquely tailored to disenfranchised communities. Who's listed first on the Board of Directors of Interrupt? Putting the pieces together, an organization that Jones is on the board of founded the Youth Media Council which is now the Center for Media Justice. A representative of CMJ is the contact person for this new coalition looking to target Limbaugh, Beck, Dobbs, et al. 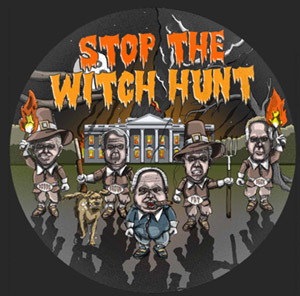 Tell Fox News to Stop the Witch Hunts! Join CMJ and Color of Change to stop Glenn Beck's program! As NewsBusters reported on August 12, Jones was a founding member of Color of Change, the group that started an online petition calling for advertisers to stop sponsoring Glenn Beck's television program. But this gets better, for CMJ's Facebook post sent readers to its "Actions" page. There, readers can find a September 11 headline, "Tell Fox News to Stop the Witch Hunts!" The embedded link sent readers to -- wait for it!!! -- Color of Change's Beck petition. This was posted at CMJ's website just five days after Jones was forced to resign as Obama's green jobs czar. Now, roughly seven weeks later, a new coalition has been created using the same phrase "Stop the Witch Hunt" for its name, and its contact person works for CMJ which was not only founded by an organization whose Board of Directors includes Jones, but also worked with Jones's Color of Change to get advertisers to stop sponsoring Beck. If you still think this is all just a coincidence, might I interest you in some swampland?